Holy moly, that’s some ultimate guacamole! Now you’re probably wondering, what makes this the ultimate guacamole? Well, first of all, it’s not that store bought artificially colored green goo. This guacamole is spicy and smoky. The secret? 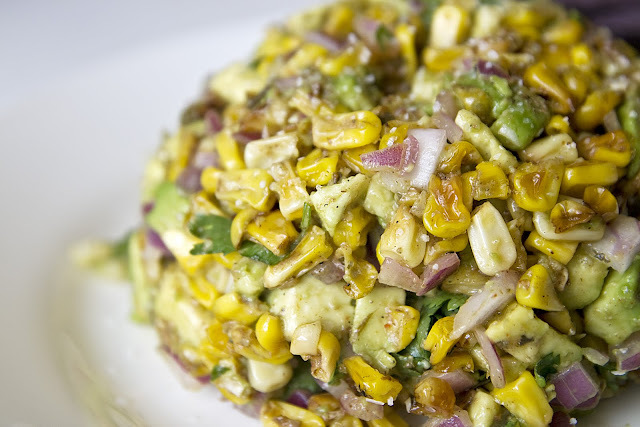 Freshly grilled avocados and freshly grilled corn on the cob. Grill the avocado halves on the grill for about 5 minutes until you get nice brown grill marks. Note that I didn’t say to peel the avocados. You want to grill with the peel on so it doesn’t fall apart on you. Mash up avocados until your desired texture. I like my guacamole a bit chunky. Squeeze lime over the avocados immediately or else it will start browning. Toss in red onion, cilantro, grilled corn kernels and garlic. Serve with chips or grilled pita bread! Mix together all the spices and mayo in a bowl. If you have a outdoor grill, brush corn with seasoned mayo and wrap in aluminum foil. Grill for 10 minutes until done. If you have a indoor grill, cut kernels off the cob and mix in the seasoned mayo. Grill over your indoor grill. I am obsessed with grilled corn. Try picking a combination of white and yellow kernel corn, it’s a lot more tender than the traditional yellow kernel. The mayo keeps the corn moist and flavorful. Try grilled pita bread for a yummy twist. I devoured the guacamole with blue corn chips. Avocados are from Avocados from Mexico. More information and recipes can be found at the website. Disclaimer: Avocados were sent from Lewis and Neale Firm from New York who asked me to create some recipes. Avocados are from Avocados From Mexico.